A joyous, vivid musical celebration of wild west travelling shows, Annie Get Your Gun is the staunchest proponent of its own merits. Cheese, fun, and exaggeration combine to pummel subtlety into submission. An adaptation of the hit 1946 Rodgers and Hammerstein Broadway show, the story is loosely based on the real adventures of sharpshooter Annie Oakley and her romance with fellow expert marksman Frank Butler. It's the late 1800's and the Buffalo Bill show featuring Frank Butler (Howard Keel) as a star attraction arrives in Cincinnati, Ohio. One of the publicity stunts is for Butler to challenge any local marksman to a clay pigeon shooting competition. Hotel owner Foster Wilson (Clinton Sundberg), disgruntled that the Buffalo Bill circus is thrashing his grounds, discovers young and scruffy Annie Oakley (Betty Hutton), who simply cannot miss with a shotgun, and enters her into the competition. Annie both handily beats Frank and falls madly in love with him. 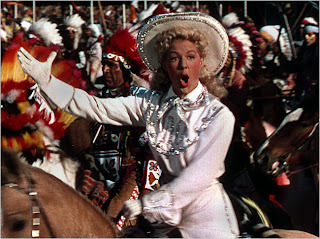 Buffalo Bill (Louis Calhern) himself spots Annie's potential for generating a crowd, and invites her to join his troop. Chief Sitting Bull (J. Carrol Naish), who leads the large contingent of Indians participating in the show, adopts Annie as his daughter and makes her an honorary Indian. As Annie's fame grows, Frank's ego is bruised and he leaves Buffalo Bill to join the competing show of Pawnee Bill (Edward Arnold). With Annie broken-hearted but with a reputation enhanced through a grand tour of Europe, Buffalo Bill and Sitting Bull have to concoct a way for Annie and Frank to get back together. 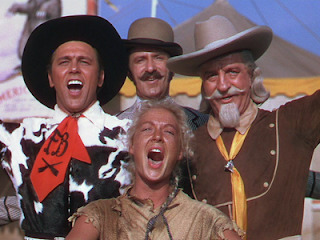 Annie Get Your Gun is loud, colourful, and almost childish in its unbridled enthusiasm. After Judy Garland stumbled out of the production either as a result of sickness or personality conflicts (or both), Betty Hutton was thrust into the spotlight and threw herself into the role inhabited on Broadway by Ethel Merman with enough gusto to individually power a small town. Particularly in portraying her adulation of Frank Butler, Hutton overacts with an eye-bulging theatrical zeal usually reserved for juvenile theatre productions. It's an unsettling aspect of a film not necessarily targeted at children, and prevents the movie from weaving any kind of meaningful spell. The other main weakness of the film is the hopelessly dated, condescending portrayal of the Indians. Perhaps the only thing worse than their traditional Hollywood depiction as savages standing in the way of the white man's westward quest is reducing Indians to a crude joke. Here they are uncouth buffoons, comic sideshows both in the movie and in Buffalo Bill's show. Mercifully Chief Sitting Bull's character is allowed to salvage some redemption in displaying the wisdom needed to help bring Annie and Frank together. Annie Get Your Gun is much better known for an outstanding set of songs, the Irving Berlin score for the Broadway production transported almost in its entirety to the film. Doin' What Comes Natur'lly and You Can't Get a Man with a Gun have the inherent bouncy energy to match Hutton's committed conviction, while There's No Business Like Show Business (Hutton with Keel, Calhern and Keenan Wynn) and Anything You Can Do I Can Do Better (Hutton and Keel) rightfully claimed their place among the all-time great tunes of Broadway and Hollywood. Working from a peppy Sidney Sheldon script, director George Sidney replaced Charles Walters (who in turn had stepped in for Busby Berkeley) to shepherd the troubled production to its conclusion. Sidney pulls together an efficient 107 minute movie without sacrificing narrative scope. The songs propel an impressive arch starting from Annie as a young, unwashed teenager and ending with her as an acclaimed international superstar having performed for Europe's royalty. 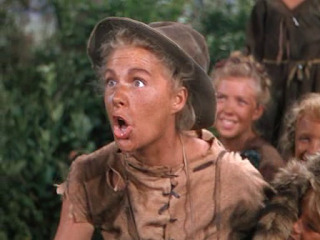 Annie Get Your Gun is enjoyable for what it is, an almost naive celebration of a slice of bewildering Americana. The music and songs are far more interesting than the story or the execution, confirmation that Annie's sharpshooting skills are more suitable for the theatre than the screen.